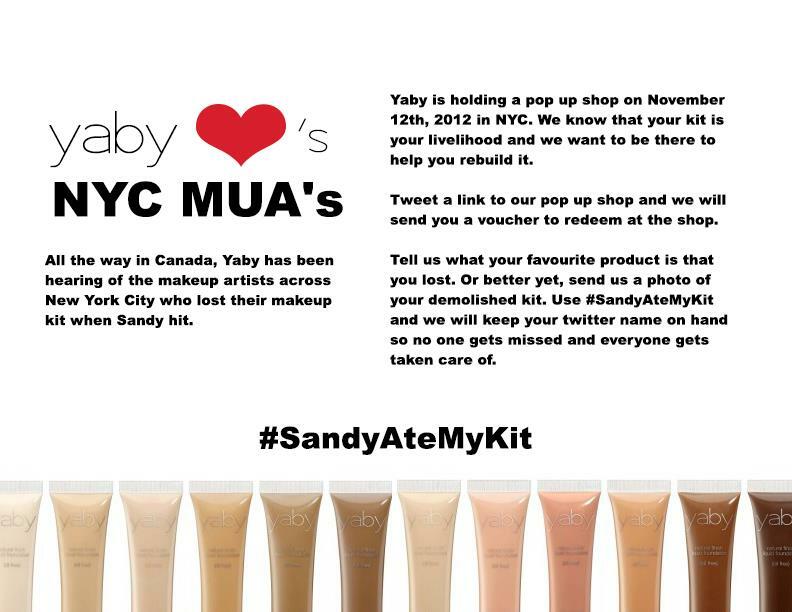 All the way in Canada, Yaby has been hearing of the makeup artists across New York City who lost their makeup kit when Sandy hit. Yaby is holding a pop up shop on November 15th, 2012 in NYC. We know that your kit is your livelihood, and we want to be there to help you rebuild it. Tweet a link to our pop up shop and we will send you a voucher to redeem at the shop. Tell us what your favorite product is that you lost. Or better yet, send us a photo of your demolished kit. Use #SandyAteMyKit and we will keep your twitter name on hand so no one gets missed and everyone gets taken care of.